When summer is over, the window air conditioner is a gateway for cold air to come into the home and for warm air to escape. If you prefer to leave your air conditioner in the window, rather than lifting it out and storing it for the winter, you will want a cover that fits snugly over the unit to protect against air leaks. 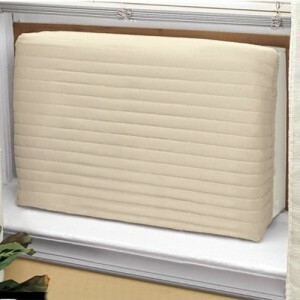 However, if you don’t have a lot of time for a big DIY project, you can purchase an attractive fabric window ac cover for less than $15. Made in the USA, Endraft air conditioner covers are a beige, washable poly/cotton fabric and come with a 100% wind blocking liner, a roll of removable vinyl tape and a set of installation instructions. Endraft is unconditionally guaranteed to stop all cold drafts, dirt, and allergens that blow through idle room air conditioners. With its high energy efficient insulating qualities, Endraft replaces non-insulating outdoor covers and can lengthen the life of an air conditioner. Exterior covers used alone cut off air circulation and trap the indoor heat. The heat then collides with the cold outside air and can cause condensation, rust, and damage. Endraft has been tested by an independent laboratory, CON EDISON, and the LONG ISLAND LIGHTING CO., and its use has been suggested to many utility customers as a major way to reduce overhead. CON EDISON told one large cooperative complex in New York City that if it covered all of its room air conditioners with Endraft, it would save $70,000 per year in heating bills! This easy and inexpensive DIY weekend project will save you a noticeable amount of energy and money each winter.